Located between data sources and analytic solutions (Tableau, Excel, SAP, BO, QLIK, etc. ), Indexima allows users to drill the entire set of Big Data with instant dashboard display, searching tens of billions of rows in just a few milliseconds. Emmanuel Dubois, Co-Founder and Chief Sales and Marketing Officer of Indexima explains: "Time to data is the time between the moment when a new KPI is recorded in the database and the moment when a business analyst can exploit it. We are fast growing and still unique with our zero time to data technology and solutions. By joining the accelerator of EIT Digital we hope to make a big step forward in our international development and reach key target markets like the UK, Germany, the Nordics, Benelux, Italy and Spain. We're really excited to be developing our network with the help of the accelerator's European team." 1) There are two ways to exploit data: either proceed to data extraction like a data cube or a data mart, which is very time consuming. Or by connecting directly to the database with a BI tool which is something that requires an incredible number of servers. 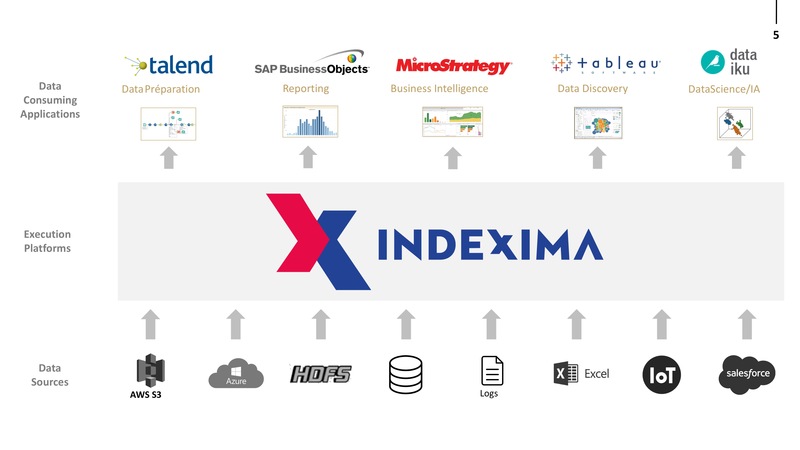 2) With Indexima solutions, one only needs to connect its BI tool directly to the raw data and get instant response time. Indexima is a mix of technologies (multi-column pre-aggregated indexes, Al algorithms, pre-calculated aggregates). What are the type of user cases where your technology can be useful? Founded in 2016, Indexima provides an indexation engine to accelerate data analysis & visualisation. It enables to query all Big Data directly at the source, in volumetrics of tens of billions of lines in just a few milliseconds. This is the Data Hub to provide IT teams with the missing "layer" in an ANALYTICS Data-Driven landscape and Data Analytics solutions such as Tableau®, Excel®, Talend, Qlik®, Power BI®, DATAIKU® or MicroStrategy®). Typical users' benefits are Zero Time To Data, Agility and IT structure savings. Indexima provides an indexation engine to accelerate data analysis & visualisation.